In the past few months, my 15 year old Hoover vacuum cleaner had become tempermental. It would sometimes work wonderfully and at other times you couldn't even get it to run. It was completely unpredictable. Some days it would shut off each time it was pushed forward but run when pulled back. At other times it would ignore attempts to turn it on, only to come alive when the handle was merely touched as I began to put it away in frustration. I began researching new models. My Hoover had performed adequately, but that was before I had pets. Now I wanted something a little more powerful and which would help in reducing allergens and so forth. The two models I seriously considered were from Riccar and Shark. I loved the fact that the Riccar models were made of wood and metal rather than plastic. They had excellent reviews for durability and quality, but even with the rave reviews, the price was more than I wanted to spend. In the end, I chose to purchase the Shark Navigator Lift Away based on the positive customer reviews, it's closed system which reportedly reduces exposure to allergens, and it's affordable price. The Shark Navigator Lift Away is both an upright vacuum and a canister vacuum. It can clean bare floors, carpeted areas, and your furniture and draperies as well. It comes with an assortment of the typical attachments including crevice tools and a pet hair "turbo power brush". It is a bagless vacuum so it can save some expense in the long run. In addition, it is a sealed system which means that unlike the typical sweeper, 99.9% of dust and allergens are trapped inside versus being expelled or circulated through the air as you sweep. This Shark vacuum comes with a 5 year warranty. The motor, filters, and dust bin all sit above the vacuum head. By merely depressing the large red "floor nozzle" button, this section (the canister) can be detached allowing you to carry it by hand when you want to be able to vacuum harder to reach areas. The vacuum head itself is 11 inches wide. To tilt the handle back for the purpose of vacuuming, you simply step on the back of the head as you push forward. Buttons to release the stretch hose, the handle, and so forth, are easy to locate as they are very large, red, and well marked. The cord is 25' long and wraps alongside the handle using large clips to hold it in place. I've owned my new Shark vacuum for three weeks now. I found it to be very easy to assemble and had the task completed within 5 minutes. The instruction booklet was concise and diagrams were useful. Details were light, but it posed no problem even for someone who has minimal experience in assembling things. While the Shark Navigator Lift Away has a primarily plastic construction, things seemed to fit tightly and clips/clamps operated smoothly. While I can't assess durability at this point, I can say that these materials offered the advantage of keeping the sweeper itself very lightweight. 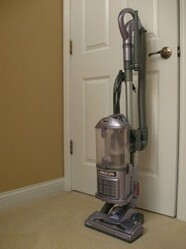 In fact, once I started vacuuming the ease of pushing this upright model around became even more apparent. Despite robust suction, this 12 pound appliance required much less effort to move around, even on carpeting, than any of my previous sweepers. While part of this ease of use was due to its light weight, the swivel head also made it easy to manuever. Vacuuming with the Shark Navigator Lift Away was noticeably less effortful for me. Because the vacuum head itself is both narrow and short (11.5" W x 1.5" H) it does fit under furniture better than other models I have owned. Reach, when vacuuming under things however, is limited by the bulky canister sitting above the head. Therefore, with lower items, reach was limited to about 12". However, the canister can be used with an accessory brush to reach under lower furniture if needed. While the narrower vacuum head might mean that you can't cover as much area with one stroke, it offers the advantage of being able to sweep in tighter quarters. The toilet in my master bathroom sits in a small room by itself. My old sweeper could not get between it and the wall. This Shark has no problem with tight areas like this. Another huge positive attribute of this vacuum is its quiet operation. I can't over emphasize how quiet this vacuum runs. It offers a bare floor mode in which only a soft hum can be heard. Even when sweeping up particles of cat litter on a tiled floor, there is no sound as the particles are swept up. When the brush is engaged for vacuuming carpet, the sound emitted obviously increases but it is still much quieter than any other sweeper I've ever used. My husband loves it. Of course a quiet vacuum that reduces the physical burden of sweeping is very good, but the bigger question would be how well does it function. I can't compare it to every model out there as I don't own them, but I can compare it to the three or four other vacuums I have used in the past. A couple of Hoovers and a Red Devil. This one is superior to those previous models. The suction is very good and it can be adjusted. It seems to offer more power than its 10 AMPS would indicate. I am most impressed however with the suction created when using the Turbo Pet Brush Tool. With this improved suction and the rotating brush on the attachment, I'm having drastically improved my success in keeping cat fur off of my upholstered furniture. The filters are washable (1x/mo) and should not have to be replaced. The belts are likewise warranted and there are no bags to replace as well. All in all, I would predict that the Shark Navigator Lift Away should also eliminate the typical ongoing costs associated with these appliances. While I am very satisfied overall with my purchase, there are a few things that potential buyers should know. The Shark Navigator Lift Away has no light on it. While that is completely unimportant to me, it may matter to others. In addition, there is little in the way of height adjustment available on this device. You can set it to vacuum bare floors (no brush engaged) or carpet (brush engaged) and you can adjust the degree of suction, but if you want 5 or 6 levels from which to choose, you are out of luck. In my opinion, the sealed system versus the typical bag system may be great for reducing the release of particles into the air as you work, but it doesn't really make clean up easier. In my experience, the dust cup needs to be empty after every use. (I vacuum the whole house) This is simple and quick enough, but is an extra step. The dust cup is released from the canister, and the bottom can be flipped open to shake our the dust/dirt/fur. In some cases, I have to reach in to free up some of this debris. This means that I do have contact with all of those particles at that point although it shouldn't be floating about in the air. While the construction of this vacuum is part of what makes it so manueverable and versatile, it ends up being top heavy. It can easily tip over when not in use. I wouldn't leave it setting out around kids, pets, or in a traffic pathway. Finally, I would also say that there are a few things that are just a bit awkward. Although the cord length is sufficient for my needs, some may find it to be a bit short at 25'. While some of the accessory tools can be stored onboard, I find that they can easily be knocked off during operation. This is a problem however, that I've had with every sweeper I've ever used. Therefore, I don't store these tools onboard. I've not really used this vacuum as a canister so I can't assess it's performance fully in those situations. However, I can say that although it comes apart and reassembles quickly and easily, I would hesitate to use it this way often. This is due primarily to my small size making the bulkiness and weight of having to lift and carry the canister a potential issue for me. For many people, this wouldn't be an issue. In my opinion, the Shark Navigator Lift Away offers some strong advantages over many other models in its price range. It vacuums effectively on carpet, bare floors, upholstered furniture, and so forth. It reduces particulates in the air as you work, offers very quiet operation, and reduces the physical burden of vacuuming thanks to its light weight and maneuverability. It is however, top heavy and has a few other minor inconveniences. Durability can only be assessed over time of course, but it does come with a reasonable 5 year warranty. Overall, I would definitely recommend this vacuum if your budget is between $160-$200. I also feel it is particularly well suited to homes with pets.